Metaphorically, the term benchmarking traces back to land surveying, where a benchmark is referred to as “a mark on a permanent object indicating elevation and serving as a reference in topographic surveys and tidal observations” (Merriam-Webster Online Dictionary, n.d.). Its linguistic roots originate from “the chiseled horizontal marks that surveyors made, into which an angle-iron could be placed to bracket (bench) a leveling rod, thus ensuring that the leveling rod can be repositioned in the same place in future”(Wikipedia, n.d.). In the most general term, a benchmark is a point of reference from which measurements may be made. Applied in a business context, benchmarks therefore serve as “measurements to gauge the performance of a function, operation or business relative to others” (Bogan & English, 1994, p. 4). Based on that understanding, the essential business concept of benchmarking can be defined as the continuous and systematic process of improving strategies, functions, operations, products, or services by measuring, comparing and analyzing relevant benchmarks in order to produce superior business performance (Böhnert, 1999; Schmitz, 1998). Thus, in contrast to the static nature of benchmarks representing reference points, according to its original meaning (ensuring the exact repositioning of leveling rods at any time) the activity of benchmarking involves deploying the former as terms of reference to make progress. In the pursuit of superior performance, benchmarking embraces the elements of comparison and change (Spendolini, 1992) based on information and knowledge derived from the very process of measuring and comparing benchmarks. First, public and private companies discover how their functions, operations, products, or services perform in comparison to those of benchmark partners. Second, having identified best practices “there is a call to action that may involve a variety of activities, from the making of recommendations to the actual implementation of change based (at least partially) on the benchmarking findings” (Spendolini, 1992, p. 15). Taking into consideration the dynamic thrust of benchmarking activities outlined above, global benchmarking of e-governments is thus widely regarded as an essential stimulus for further e-government development, as it may facilitate the evaluation of national efforts compared to international best practice on the one hand and promote successful implementation of e-government applications serving the needs of citizens and businesses on the other from a conceptual point of view (Kunstelj & Vintar, 2004). In order to identify the contribution of international benchmarking studies to successful design and implementation of e-government initiatives and models, this article will present the study designs and major outcomes of three benchmarking reports on e-government development. 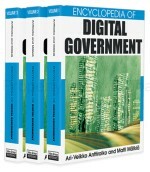 Based on these findings the authors will critically review these three study series, by raising the question whether the approaches pursued to benchmark e-government development show the aptitude to cope with the complexity of the socio-technical system e-government and thus support its comprehensive evaluation.